Although health IT news is a bit slow in the run-up to HIMSS, I’m pleased to see that things are starting to pick up. I’m back on Twitter after a long hiatus and enjoying some of the conversations around HIMSS shoes. In looking for comfortable yet fun alternatives, I realized there is an entire market dedicated to alternative prom footwear of the sneaker variety. 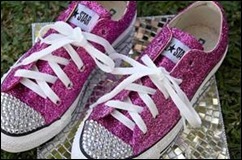 Although I’ve been to a wedding where the bride wore vintage Chuck Taylors, she was a PE teacher and it was part of a running joke. I’m going to have to completely rethink my plans for HIStalkapalooza. I’m putting together my list of vendors to visit as well as my list of spectacles to try to photograph. As usual, several booths are planning a Las Vegas theme with blackjack or games of chance. 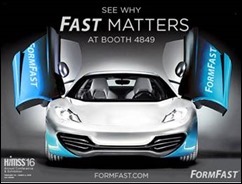 Others such as FormFast are bringing exotic supercars or other “cool factor” displays. I always enjoyed the Indiana Jones-style guy they had in their booth that would throw hats to the audience. At least they’re tying in the car with their name and their business line through their “Fast Matters” campaign. I’m also seeing an uptick in pre-HIMSS webinars as well as a couple of vendor campaigns encouraging practices to seek out replacement systems. I don’t know if it’s tied to HIMSS or not, but it was noticeable. My favorite communication from an EHR vendor this week was from Kareo, who asked me to take a survey about my practice’s success with their system. They should know that I haven’t logged on to their system in more than six months, which should be telling enough. Edifecs has launched the #WhatIRun campaign supporting women in technology. They are donating a dollar to brightpink.org for every share or tweet of the #WhatIRun hashtag. Visit them at booth #8107 and they will also donate $5 to Miracle Flights for Kids. NCQA has proposed an “ambitious redesign” of their Patient-Centered Medical Home recognition program. They’ll be hosting a Google Hangout on February 24 where practices can get an update on the redesign progress and hear from practices that participated in a redesign pilot program. I’m interested to hear about the changes, which will not only impact practices but also EHR vendors who support clients in achieving recognition. The Patient-Centered Medical Home movement is turning nine this month and the American Academy of Family Physicians put together a nice blog post summarizing a recent review of studies around the impact of PCMH on cost and quality. Telemedicine is a hot topic and I was intrigued to hear about Nurx, which allows women in California and New York to receive prescription and delivery of FDA-approved contraceptives within 48 hours of accessing the app. They have plans to expand to HIV PrEP (pre-exposure prophylaxis) as well. Some are referring to Nurx as “the Uber of birth control” and I’ll be interested to see how it goes. I recently had the opportunity to speak at my local school board about proposed changes to their human sexuality curriculum, so I can imagine feelings about such a service will run the spectrum. Nurx waives its consultation fee for uninsured patients and in some markets patients can receive their medications the same day. Plans for expansion into markets in Illinois, Washington, and the District of Columbia are in progress. For those of you who have been following my ongoing saga about Maintenance of Certification requirements for the Clinical Informatics subspecialty, I have some good news to report. Several Institute for Health Improvement Open School courses have been approved for ABPM LLSA credit. If you’re a member of an ABMS specialty board, you are eligible for a 10 percent discount by entering the code MOCABMS at check-out. Approved courses cover quality improvement, graduate medical education, and patient safety. Packing for HIMSS is always a challenge and a reader shared a link to Heelusions as a way to make things easier. 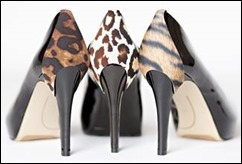 Invented by the reader’s wife and her mother, it allows you to accessorize a single pair of shoes for multiple looks. I’m all about supporting small businesses, so I’m happy to share. It’s a cool idea, but sadly my stiletto days are numbered. Seeing patients this week has been a bit bumpy, with our cloud-based EHR being down intermittently for the last few days. Luckily our downtime procedures went more smoothly than the last time we had an outage, but it’s never fun when you don’t have all the regular tools at your disposal. I’m back in the office tomorrow so cross your fingers for me. What’s the most annoying thing about the EHR being down? Email me. Please tell your avid readers why this is happening and what procedures your organization has in place to prevent this? 3) Paper charting with upload of written notes.